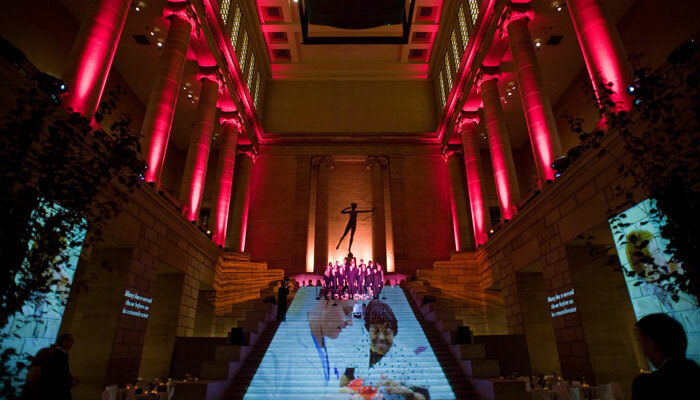 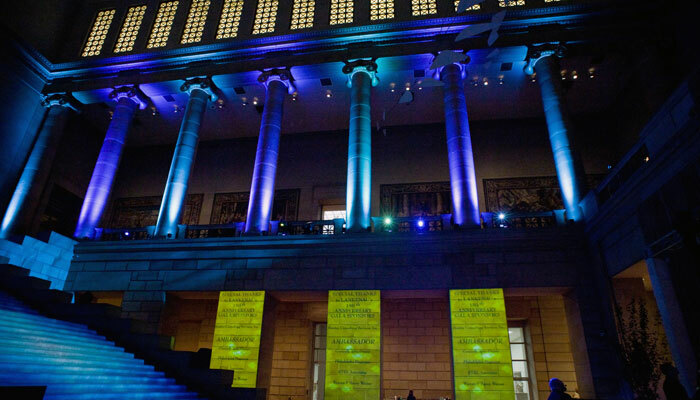 Create and develop fresh program content for the black tie gala celebrating the 150th Anniversary of one of the nations leading heart surgery hospitals and stage it at one of the most iconic museums found on earth. 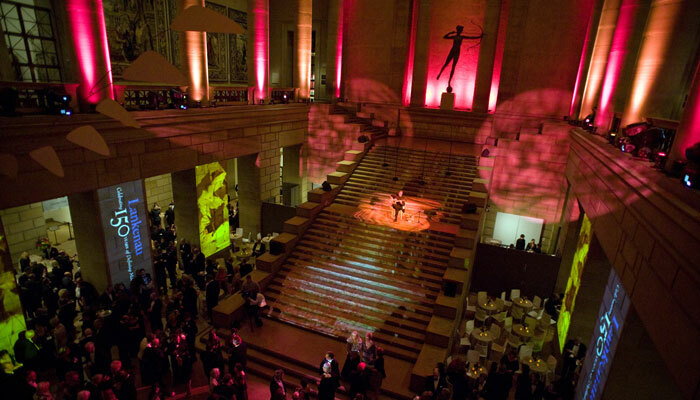 Dissecting the event itinerary, guests gather in the Great Stair Hallway of The Philadelphia Museum of Art for cocktails then move outside to the Grand Terrace for dinner and awards. 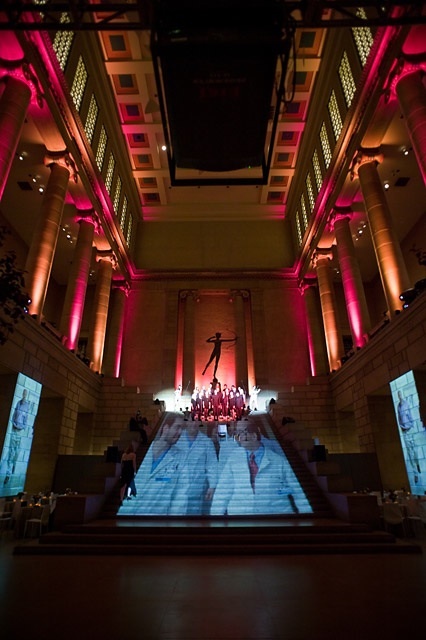 Transitional sequences were to be key in helping to move guests from space to space as well as creating program interludes to keep content fresh. 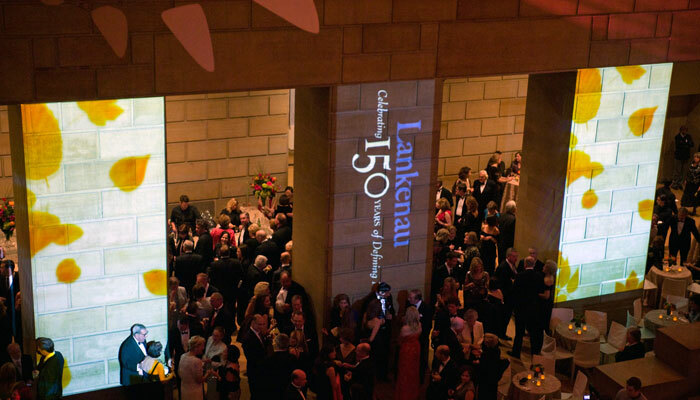 Realizing the challenges of doing traditional screens in the Great Stair Hallway, we maneuvered ourselves around the audiences vantage points and saw that the actual staircase and 30′ granite stone columns were perfect projection surfaces from which to tell the story of Lankenau Hospital’s 150 year history. 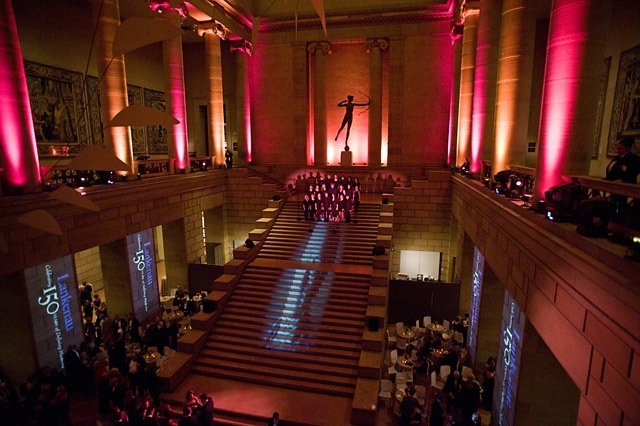 With the main sequence projected as 30′ x 20′ images on the actual staircase and supportive images and title sequences projected on six 30′ x 10′ columns, the visual imagery was enhanced by a live performance from The Silvertones, a globally recognized high school choir from Tony Buemi’s high school alma mater, Strath Haven. 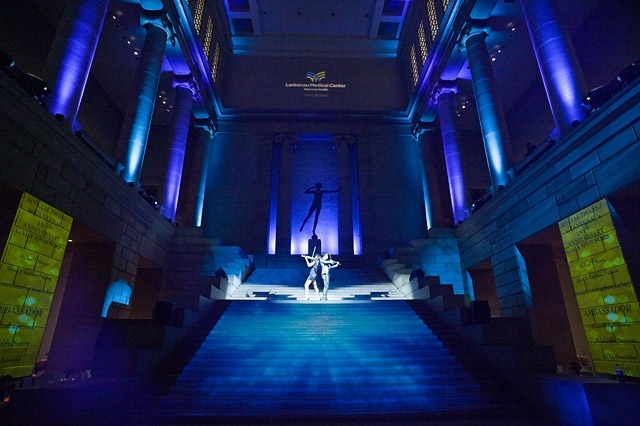 A featured performance from Fuse!, the electronic rock group from Britain, lent a beautifully rendered adaptation of Leonard Cohen’s haunting “Hallelujah”, created in the style of rock folk legend Jeff Buckley with re-worked lyrics performed by The Silvertones. 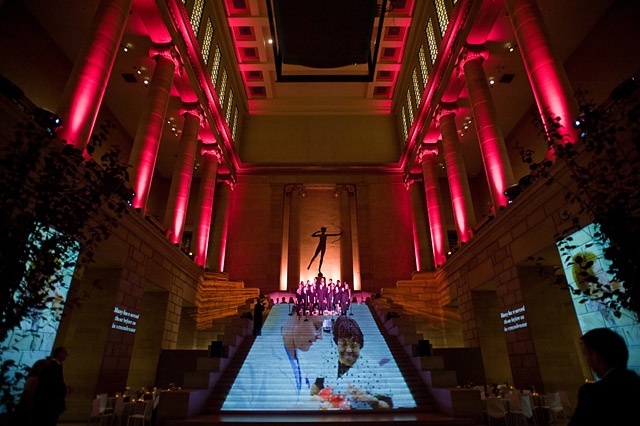 In addition to multiple projection systems staged strategically in the Great Stair Hallway, a host of VariLight 3Ks added color and texture to the projected video images. 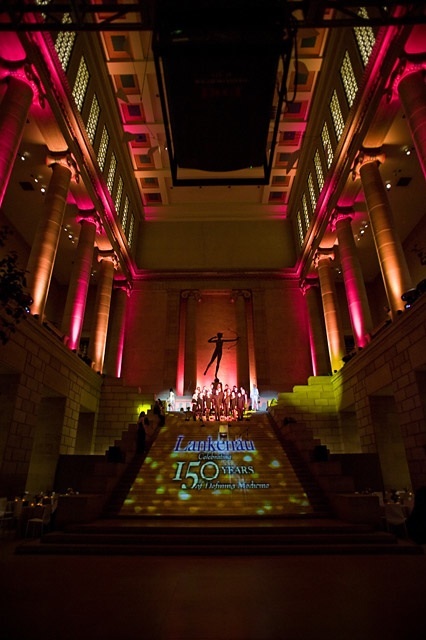 Golden hues of amber and deep burgundy danced softly as leafy images married gracefully into the stunning architecture of this magnificent space. 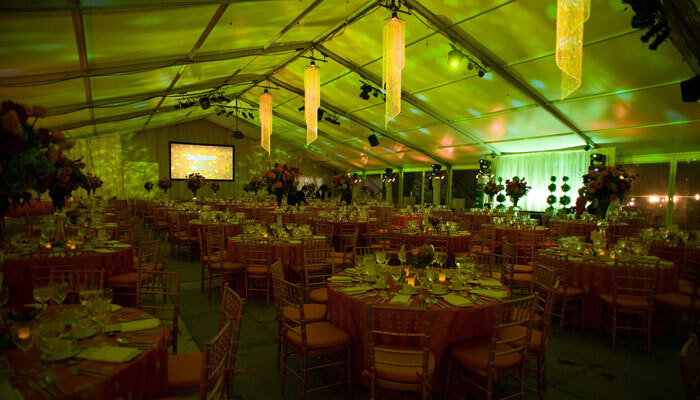 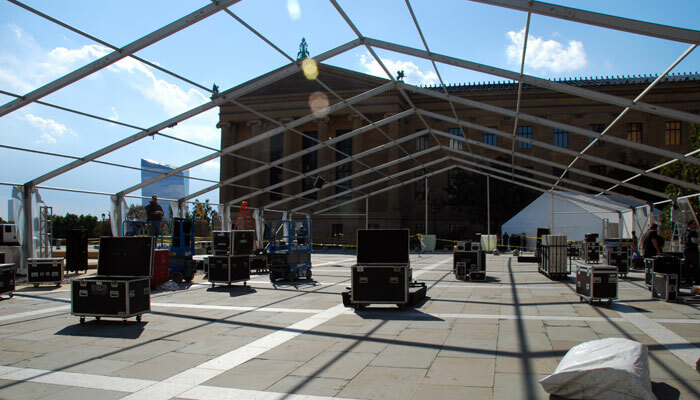 Dinner and Awards were staged in a 20,000 square foot clearspan tent where we added 16 DL3 light projection units which were used to simulate an electric fireworks display projected on the ceilings and sides of the tent. 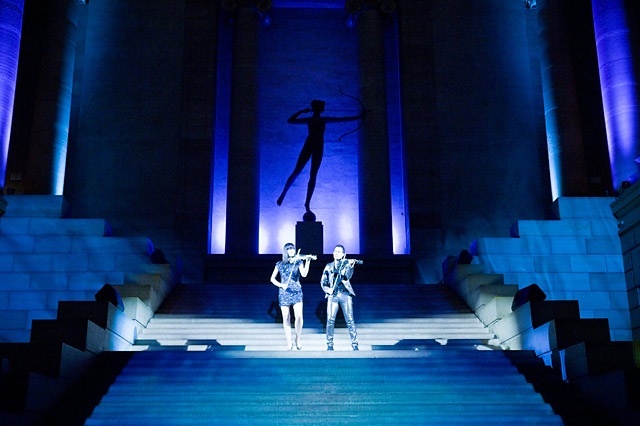 A reprise performance from Fuse! 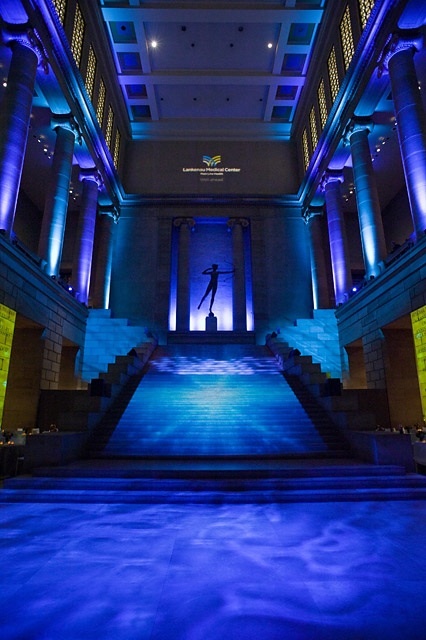 features the lovely Linzi Stoppard and energetic Ben Lee walking up the famed Art Museum steps as the City of Philadelphia glistened in the autumn sky.